9 Projects for Grusby Woodworks LLC. 26 Reviews for Grusby Woodworks LLC. I can’t recommend Scott highly enough! When I was looking for someone to design kitchen cabinetry for my kitchen renovation scott was most helpful . 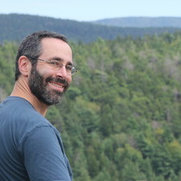 I am a local realtor in the Boston area, and Scott came to me as a referral from a past buyer. My kitchen & my home are not large but Scott had a wonderful eye, a great taste level & knew exactly the look I was trying to achieve. His quality of work is impeccable & I trusted him completely. He has a wonderful demeanor ... important during a project like this ..& I would hire him again in a second! Scott is a consummate craftsman who takes tremendous pride in his work. His attention to detail is exceptional. He did an outstanding job of the cabinets and hutch for our kitchen and dining room renovation. He was wonderful to work with and had great design recommendations. He helped us find the perfect balance between utility and aesthetics for our small space. The outcome is even more spectacular than we had envisioned. Thank you Scott!! Scott was great to work with, was very flexible, had some helpful creative ideas and the quality of his work is TOP NOTCH. The cabinets are stunning.....absolutely gorgeous, beyond by highest expectations!! I am so happy with my kitchen and highly recommend working with Scott and Grusby Woodworks!! Scott custom-built beautiful heritage style cabinets for our Victorian modern kitchen. It was important to me to get a local craftsman rather than buy from a bigger store. Scott is extremely professional and easy to work with, and has a great eye for detail. He provided suggestions as needed and worked with the designs that we brought to him. I would highly recommend Scott and his shop! We worked with Scott to build our kitchen, bathroom and mudroom cabinets. We are extremely pleased with his work. 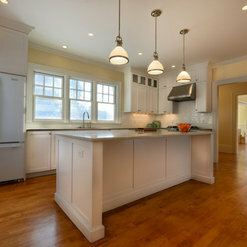 Nearly everyone who has walked into our kitchen declares "Wow - I love your cabinetry!" We love it too and it is so very functional as well as aesthetically beautiful. We can't say enough good things about Scott Grusby and his team! Scott has an incredible way of listening and of making it clear that he wants his customers to be completely happy with the results. He and Patrick were incredibly detail oriented and they were an absolute pleasure to work with every step of the way. Their work is truly EXCELLENT! Our kitchen is beautiful! 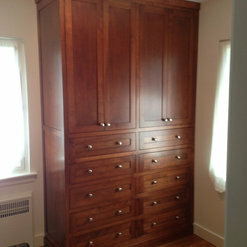 We were lucky to find Grusby Woodworks and we recommend them without hesitation! We hired Scott Grusby and his team at the recommendation of our architect, and we have been absolutely thrilled with every aspect of his fine work. We had a series of meetings with Scott to plan out our kitchen and two bathroom vanities, and he has such excellent communication skills that he made the planning process fun. He has a warm, friendly interpersonal style and he contributed many creative ideas in response to our discussing how we wanted to use our space. 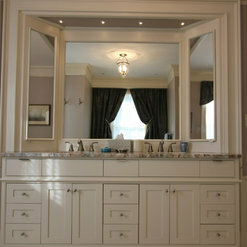 Our kitchen cabinets and vanities are beautiful and we have had many people ask us who built them. I would recommend Scott Grusby and his team in a heartbeat. I most appreciated his honesty, his patience, his follow-through, and his expert craftsmanship. 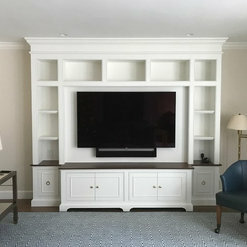 If you are looking for a professional cabinetmaker I would look no further— hire Scott Grusby Woodworkers and his team!!! 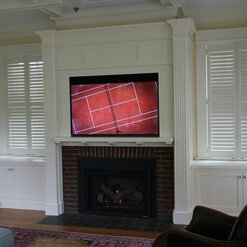 Scott recently completed our family room built-ins and they came out absolutely beautiful! The detail and quality are top notch and we couldn't be happier with the project. Scott was able to put together a plan that we loved and was easy to work with. Scott is an absolute gem. We couldn't love our new kitchen cabinets more. He does beautiful, meticulous work and takes great pride in the details and ensuring you love the end-result. Scott was by far our favorite sub-contractor to work with out of the 20+ involved in our complex renovation project. He does beautiful work and is a pleasure to work with all around -- on time, on budget, and with a beautiful, high-end finish. 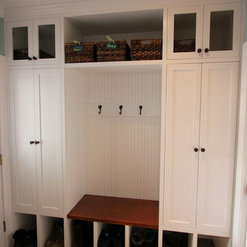 I hired Scott to build a custom bench and shelving in our mudroom. The project went very smoothly, and we are very pleased with the end result. Scott was very professional and easy to work with. I appreciated his responsiveness throughout the project and his attention to detail. I would not hesitate to hire him again. 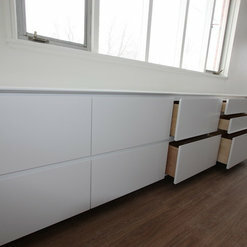 We hired Scott after a recommendation from our architect to build our kitchen cabinets. From the beginning of the process Scott was thorough and professional. He was responsive to emails and texts and kept us informed throughout the process. Scott installed the cabinets and we are very happy with how they turned out. I am an architect, and I worked with Scott and his crew at Grusby Woodworks on a major renovation of my house. This project included a significant amount of highly detailed contemporary cabinetry and architectural elements. Scott is a pleasure to work with, and his craftsmanship and attention to detail is superb. He is very willing to work through particular and unique formal and material circumstances with great aplomb and creativity. He produced a detailed budget at the beginning of the project and kept to his estimates as the project was completed. I feel that he is extremely fair in his pricing while being absolutely dedicated to a high-quality outcome. I highly recommend Scott and his crew. Commented: what is the brand of the ovensthey are Miele brand ovens. Commented: countertopYes it is Silestone, though I don't recall what color was chosen- sorry. 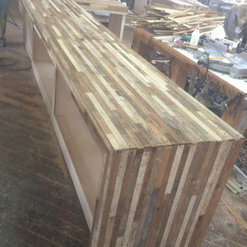 Commented: what type of counter top is this?Hi- This is a slate countertop. Thanks.